Welcome to the six hundred and twenty-first of my blog interviews with novelists, poets, short story authors, biographers, agents, publishers and more. Today’s is with historical romance novelist Nandita Chakraborty Banerji. A list of interviewees (blogged and scheduled) can be found here. If you like what you read, please do go and investigate further. Morgen: Hello, Nandita. Please tell us something about yourself, where you’re based, and how you came to be a writer. Nandita: I am based in Mumbai. I always loved to express things in writing. I love the English language and playing with words is something I find very creative. I enjoyed writing short stories during my lunch breaks at work (my blog: http://create.sulekha.com). As for writing a book, I wanted to write something about the hippie era having witnessed some of it in my childhood without actually being a part of the culture. I found that writing is something I would like to do again and again. Portraying Indian culture and a foreign culture that lay side by side and yet coupled to produce people like my characters was an exciting thought. Morgen: The actual writing if my favourite aspect and whilst a blank page can be daunting, there really is nothing (with the exception of reader feedback) as thrilling. What genre do you generally write and have you considered other genres? Nandita: I have written in the genre of historical romance and would like to write more on romantic and social issues and exploring of relationships. Morgen: What have you had published to-date? Morgen: I see your book is available as an eBook, do you read eBooks or is it paper all the way? Nandita: I prefer reading paper because I find it more convenient to curl up with and carry around. Morgen: Most people do although for journeys / holidays it’s great having so many in one place. Do you have a favourite of your characters? If your book was made into a film, who would you have as the leading actor/s? Nandita: My main protagonists are my favourites. If my book was made into a film I would have Leonardo di Caprio as Chris and Vidya Balan (Indian actress) as Shibani. (Chris and Shibani are the main characters of my book). Morgen: Did you have any say in the titles / covers of your books? How important do you think they are? Nandita: Yes. I did have some say in the title and cover of my book. I think it is very important for the author to have a say in these matters because the concept of the book has been meticulously thought and created by the author. The title and cover need to give the right message to the audience. The author feels dissatisfied in case the title and cover do not portray or do not conform to the author’s requirement and imagination. Morgen: They certainly should represent the inside, and you have a great cover and intriguing title. What are you working on at the moment / next? Nandita: I am working on my next novel, which is untitled as yet. It will be based on a social issue. Nandita: I do suffer from writer’s block and do not write everyday though I would like to get back to the stage when I can write every day because those are the happiest days of my life. However, my Facebook fan page (https://www.facebook.com/Themysteriousdreams) where people ‘like’ my book’s page is increasing steadily and this motivates me a lot. Morgen: When I’ve been running the 5pm Fiction slot (last June – October, it returns 1st February) I was writing ever day and have missed it. I wrote the beginning of a novel (51,000 words) for NaNoWriMo in November so I’ve only not been writing for six weeks but it seems like an age. Roll on 1st February (of course I could write before then but the blog / emails are hogging my time at the moment). Do you plot your stories or do you just get an idea and run with it? Nandita: I normally get an idea with a mini plot and start off but as I write I start building a plot. Morgen: Most of the authors I’ve spoken to have said the same. Do you have a method for creating your characters, their names and what do you think makes them believable? Nandita: I take examples from my observation of people in real life for creating my characters and their names. Also, I feel I have a vivid imagination and can imagine conversations fluently. I think their earthy characters make them seem like real people. Morgen: They say to write what you know (I don’t, I write primarily crime fiction) but we do get our inspiration from what’s around us, don’t we. Do you do a lot of editing or do you find that as time goes on your writing is more fully-formed? Nandita: I go on editing as I write because I always feel I can write something in a better way, with more conviction and humor. Morgen: One of my Monday night writing group spends a whole day “agonising” (her word) on one sentence. I don’t think I’ve spent that long on one chapter, although I do several edits on pretty much everything I write. Do you have to do much research? Nandita: Doing or not doing research depends on the subject of the book. If it is a story from one’s life and imagination then there is not much research but if it is a historical one then research is necessary. Morgen: What point of view do you find most to your liking: first person or third person? Have you ever tried second person? Nandita: I like both first person and third person and have written in both. No, I have never tried second person. Morgen: It’s an acquired taste, and usually produces quite dark fiction. I’d recommend having a try for shorter pieces. Do you write any poetry, non-fiction or short stories? 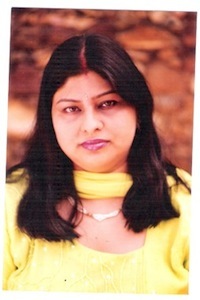 Nandita: Yes, I write short stories on my blog: (http://create.sulekha.com). Morgen: Ah, then definitely try second person. Have you had any rejections? Nandita: No. I have not faced any as yet. Morgen: Congratulations. I’ve had very few authors say they’ve not had any. I like to think it’s just the wrong person for the right piece. Do you enter competitions? Nandita: I do enter competitions sometimes. Morgen: Social networking and websites / blogs are real weapon for authors, as long as they have something to say other than just “buy my book”. It’s the quickest way to put someone off. What’s your favourite / least favourite aspect of your writing life? Has anything surprised you? Nandita: My flow of language when I feel something deeply does amaze me at times. I love to write about feelings and about the nuances of life that mostly go unnoticed. I do not like to write much on descriptions of places, clothes, etc but I realise that is a very essential part of writing to give the reader a more complete picture about the story. Morgen: I’m not a fan of too much description; if I turn the page and there’s a large block of it, I skim read (or skip it completely!). What advice would you give aspiring writers? Nandita: I would tell aspiring writers that they should write from the heart without being conscious about the audience or whether they will like it. It can always be edited and rounded off later in case the author decides on a target audience. The earnestness, sincerity and honesty of writing something from your heart definitely shows up in the piece of writing and goes across to the reader. Use simple but interesting language. Morgen: Absolutely. Don’t use ‘walked heavily’ when you can say ‘stomped’. Is there a word, phrase or quote you like? Nandita: I follow ‘Live and let live’. Nandita: Singing and learning new songs is something I enjoy as much as writing, especially songs with moving lyrics like love songs. After all, music also portrays emotions and messages just like writing. Morgen: I love having music on while I work, although only classical if I’m reading or writing as I get distracted by words that aren’t my own. Are there any writing-related websites and / or books that you find useful? Nandita: www.LinkedIn.com has lots of groups of like-minded people or those with similar aspirations who can share ideas. Morgen: And probably how we met. It’s a great site, and tool for anyone who wants to know something; there are always other writers ready to reply. You mentioned Facebook, are you on any forums or other networking sites? If so, how valuable do you find them? Nandita: Twitter. I found social networking forums very useful to share and spread ones work, experiences and wisdom. Nandita: I think if a writer can capture readers’ imagination, or portray a situation that many people may not be aware of, or get a message across that can help change people’s lives, then the writer’s future is definitely bright. Morgen: I think so too. There are definitely more people reading these days because of the options open to them. I’ve not yet used my BlackBerry for reading but I do on my iPad’s Kindle app and I love it. Where can we find out about you and your writing? Nandita: As well as the websites mentioned earlier, you can have a look at an author interview at http://the-vault.co.cc/author-interviews/nandita-banerji. Shibani shook her head with fresh optimism. She had her own philosophy of life. Whenever she was disillusioned with her cushy life, she wished she would find herself in a new place, possibly in a different reality, when she woke up the next morning. As if that would signify the end of her problems and catapult her to the life she desired. Each morning held the hope of catharsis for Shibani as she weighed her strange nightmare. With a painful wrenching out of vital energy from her heart…a swift sitting up; the surroundings ink blue; a feeling of desperation, despair, and hopelessness engulfing her…. Shibani had woken up with a jerk. She had felt the jerk of falling from a great height and she had seen her head explode into pieces, spilling the cells of memory, recognition, and intelligence all over. Clutching her head with both hands, Shibani opened her eyes and took in the yellow walls of her bedroom. It was typical government quarter yellow. She was perplexed and her vision was blinding with colors all around her. Her heart had started pounding. Though this happened every other night, Shibani felt the same horror each time. Running to the window, she even looked down to see if her body was lying on the hard compound of the building. She seemed to have lost track of time for a few fleeting moments. Shaking her head to get over the confusion, she tried to bring her mind back to the present situation. She looked around foolishly for anyone spying on her or they would wonder what she was looking for from her window the first thing in the morning. She quickly went back and sat on the bed. Feeling the cold wet bedding under her buttocks, Shibani jumped up. Her mother would be upset again. She quickly stuffed the soiled bed clothes in the bathroom and opened the window fully to let out the stink. She hung the red oil cloth to dry. The oil cloth had been her constant bed companion ever since her infanthood. Only it had grown in size with the years. Enuresis bothered her at least thrice a week. Her mother used to throw up her hands in desperation in the earlier years. But now she seemed more resigned. 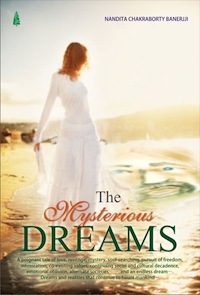 Mrs Ganguly was completely unaware of her daughter’s recurring dream. Nandita Chakraborty Banerji, based in Mumbai, is a microbiologist and ghazal singer. While working as a Manager in the corporate world handling technical documentation, instructional design, and copywriting for the various media, the thirst for writing something original and creative from the heart poured forth in the form of short stories and jokes, some of which have been published in publications like the chicken soup series and other magazines. She loves to write about the peculiarities of the human ethos underlying people of all times and places. This is her first novel and she is currently writing her next that explores the woman-society relationship. You can sign up to receive these blog posts daily or weekly so you don’t miss anything. You can contact me and find me on the internet, view my Books (including my debut novel, which is serialised on Novel Nights In!) and I also have a blog creation / maintenance service especially for, but not limited to, writers. If you like this blog, you can help me keep it running by donating and choose an optional free eBook. Lovely site to wander around really. Just got here from LinkedIn – Samasti which means “Be a Light unto yourself” is my private blog, which I like to write in sometimes. Thank you very much, Samasti. Do feel free to wander, pull up a comfortable chair, there’s plenty to see. Enjoyed this interview very much and wish Nandita much success. My husband is in Mumbai and keeps telling me it is a place of millions of stories jut waiting to be written, such vibrancy and colour and energy radiates from the streets….so I can see where you get your inspiration. I wish you lots of future success. Thanks Jane Risdon for your wonderful words…you lifted my spirits and made me think more seriously about my writing. I am grateful to Morgen Bailey for taking the interest and time in carrying out this interview and I enjoyed it very much. Nandita, so glad that you enjoyed your interview with Morgen, such a great opportunity. She has given me space for my Flash Fiction and Short Story contributions so I appreciate how helpful she can be. I an happy to lift your spirits any time….just pop in and say hello whenever you wish. I will be popping in to visit you again. Have a lovely week.